Asphyxiation is the process by which asphyxia (lack of oxygen which interferes with the oxygenation of the blood) occurs. Asphyxiation can result from a number of factors such as 1) suffocation/strangulation or 2) inhalation of an asphyxiant such as 100% nitrogen gas. 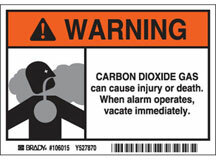 All rooms with fixed extinguishing systems must have appropriate warning signs like this one from Safety Emporium. Asphyxiation can lead to death. See the entry on asphyxiants for more details. OSHA Fatal Fact Sheet #36 discusses a sandblaster who was asphyxiated when his air supply was hooked up to a nitrogen line instead. OSHA Accident 14401913 from 07/17/1985 discusses a sandblaster who was asphyxiated when his air supply was hooked up to a nitrogen line instead. This OSHA PowerPoint presentation Silent Killer in a Newly Constructed Manhole discusses an unexpected asphyxiation death during confined space entry into a manhole. 20 Russian submariners were killed in November 2008 after being asphyxiated by the fire control system on their vessel. See also: anoxia, asphyxia, asphyxiant.